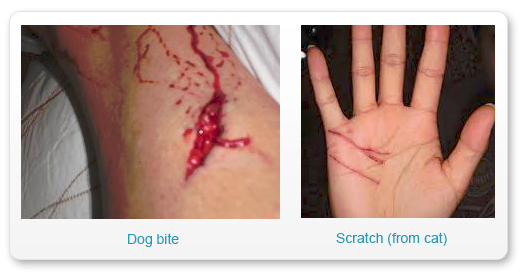 Bites and scratches are acute wounds varying in depth and severity. Generally inflicted by an animal (pet or wild) or occasionally by another person, this type of injury is frequent in young people under 20 years of age, especially children under 10. The incidence of cat bites is however, especially high in adult women. Bites to the head and neck are most frequent in infants and young children and account for approximately one third of the reported cases in this age group. A survey in Switzerland estimated an annual bite and scratch of animal origin incidence rate of 325 per 100,000 of the population a lower rate was found in a similar survey carried out in Italy. The majority of bites in both cases were from dogs 79% with cats accounting for 20%. The increasing pet population in urban areas would suggest that these rates will continue to rise with the associated medical and public health monetary costs. Wash the wound with soap and water without scrubbing. Apply an antiseptic lotion or cream. healing will be fast (5 to 15 days depending on the skin thickness). The result will be aesthetic, functional and satisfactory with minimal scarring. Look out for signs of infection at the site, such as increased redness or pain, swelling, discharge or a fever. Where there is a loss of dermal tissue and uneven edges that cannot be brought together by suturing there will need to be controlled healing with use of the correct type of dressing to facilitate the most rapid and complete healing possible. Even a minor scratch or bite from an animal car represent a risk of infection, especially from cats because of the bacteria carried in their gums and claws. If the wound is deep and/or the bleeding cannot be stopped medical attention is needed urgently. Patients should ensure that they are vaccinated against tetanus and, if the animal’s rabies status is unknown, should seek medical advice. Bites should be taken particularly seriously because they are puncture wounds that can deliver bacteria deep into the skin, therefore medical intervention is important. Signs of infection include: inflammation, oedema and pain. To prevent the risk of bites and scratches patients should be aware that, all animals, even well-trained ones, can be unpredictable. When dealing with animals it is always best to be cautious especially if the animal is stressed, frightened or injured. Small children should be taught to approach pets without sudden or abrupt movements and never be left alone with an animal.